Peter the Great (1672 – 1725) was a bad man to anger. A transformative figure in Russian history, Peter was bigger than life, both figuratively and literally – he stood at 6 foot 8 inches, which would make him an uncommonly big man today, and which made him a veritable giant in his own era. He is best known for having taken over a backwards Russia, and dragged it – often kicking and screaming – out of the medieval rut in which he found it, and into the mainstream of European culture. A man who went at life full tilt, Peter did not seem to understand the concept of half measures and moderation in whatever he did. That extended to his grudges and vindictiveness, which Peter took to extremes, just like he did everything else in his life. An illustrative example of that was Peter’s treatment of Willem Mons, rumored to be his wife’s lover. The emperor had Mons beheaded, then reportedly had the head pickled in alcohol and placed in his wife’s bedroom. Peter first came in contact with the Mons family in 1691, during one of his frequent visits to Moscow’s German Quarter. There, he met and fell hard for Anna Mons, the daughter of a Dutch wine merchant. Anna became Peter’s longtime mistress, and her family’s fortunes rose, as they were elevated from commoners to Russia’s elites. Her sister Matryona was married off to a major general and governor of Riga, while her younger brother, Willem Mons, eventually became the personal secretary of Peter’s future wife, Catherine I. 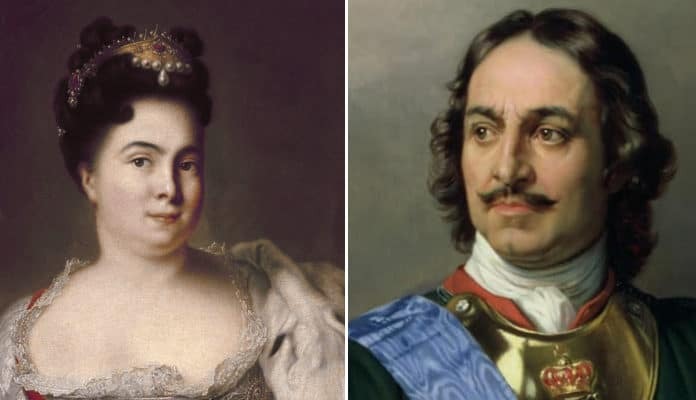 For a while, especially after Peter soured on his then-wife, Eudoxia Lopukhina, it seemed that Anna would marry Peter and become the next Russian empress. Anna became the emperor’s quasi official royal mistress, and he showered her with gifts and estates, including 295 farms and a Moscow mansion. However, after twelve years, Peter began losing interest in Anna. So she tried to rekindle his affections by making him jealous, and began flirting with the Prussian ambassador. It backfired when the ambassador, oblivious to his status as a prop in Anna’s machinations, proposed marriage. Peter, rather than rediscover his affections for Anna, flew into a rage. He confiscated the estates he had gifted her, and placed her under house arrest, along with her mother, her sister, and dozens of her friends. Peter eventually relented, freed Anna and those he had arrested alongside her, and allowed his by now former mistress to marry her Prussian beau. In the meantime, Peter had fallen in love with another commoner, a Polish-Lithuanian servant and daughter of a peasant, or gravedigger, or handyman, or runaway serf, depending on the sources. Whatever her father’s occupation, Peter married her in 1707 and made her his empress, Catherine I. In the meantime, Anna Mons’ sister, Matryona, wasted no time after her release from house arrest in making a beeline for the new empress, and before long, she had become Catherine’s confidant and one of her best friends. Matryona put in a good word for her brother, Willem. The third Mons sibling, Willem Mons (1688 – 1724), had fought for Peter at the Battle of Poltava in 1709, and had not suffered unduly from his elder’s sister downfall as Peter’s mistress. When his other sister, Matryona, introduced him to the new empress, Willem made a good impression upon Catherine, and with her support, he won advancement, and was put in charge of managing many of Peter’s estates. He was also made Catherine’s personal secretary, and began accompanying her on her trips abroad. His rapid rise aroused the jealousy of many of Russia’s elites.